Buy this Magazine, #2 — Blog — TypeOff. Linotype began distributing the second issue of the Linotype Matrix at TYPO Berlin 2006. This issue’s cover story reports on the life and work of W.A. Dwiggins (the article was written by Paul Shaw, and designed by Tiffany Wardle). 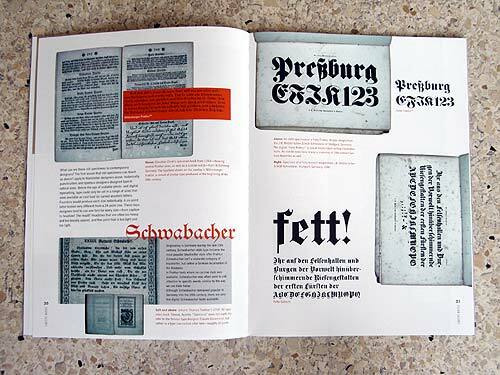 But you should really buy the magazine to read my photoessay on historic type specimen in the Gutenberg Museum library. The magazine is available on the Linotype website. With 64 pages, it is a bargain at just 15 USD/EUR. Order it today! Below are three snapshots of my article. I visited the library at the Gutenberg Museum last December. 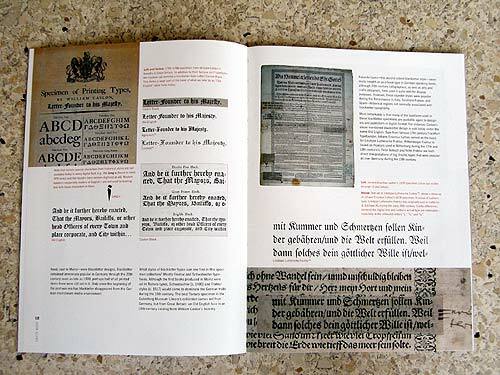 My favorite historic specimen was a single, poster-sized sheet from Johann Erasmus Luther’s foundry in Frankfurt. It was printed c.1678. The type inspired Luthersche Fraktur, available as a digital font at Linotype. The best treat was to be able to thumb through a Caslon foundry specimen from the 1780s. 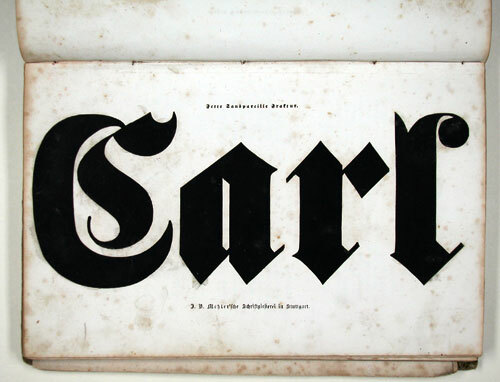 In addition to the fabled serif types, the Caslons also sold a seminal blackletter type (similar to today’s digital Old English), as well as typefaces for non-Latin writing systems. What a delight to see a real, authentic “fette Fraktur;” one that isn’t as perfect as today’s digital version. That particular 1840 J.B. Metzler’sche catalog was a laugh to readâ€¦ a real page-turner. And very German. Here’s one of the photos I took that unfortunately didn’t make it into the article. 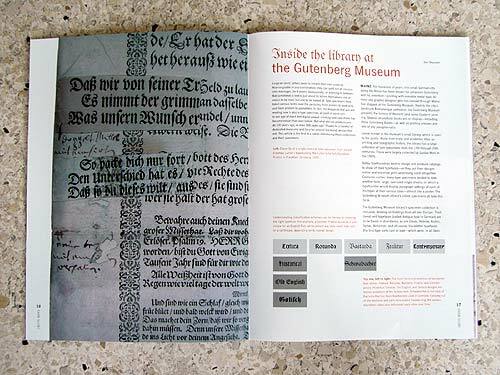 The Gutenberg Museum’s library isn’t as well-visited as its other attractions, but it is open to the public, and worth a visit.